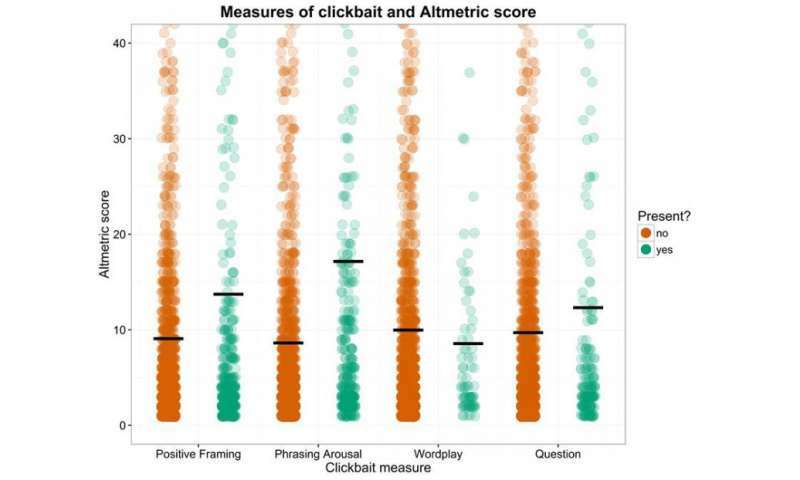 According to a recent study, journal articles whose titles contain 'clickbait-y' characteristics are shared more widely. Analysing over 2000 titles from articles published in Frontiers in Psychology in 2013 and 2014, researcher Gwilym Lockwood from the Max Planck Institute for Psycholinguistics, Nijmegen, discovered that positive framing and more interesting phrasing lead to more attention online. The internet is enormous. There are so many pages, so many links to look at, that it's easy to get lost in all the noise. That's why people put a lot of thought into designing the title of a link so that the website grabs the attention of a potential reader. Sometimes this goes too far and titles become too sensational, misleading and superficial, like the following headlines: "The story of this dog is so inspiring you'll cry. Wow. ", or "OMG. You'll never believe how awesome this little girl's message is." This type of title is known as clickbait. While clickbait is more noticeable, there are certain techniques in regular newspaper headlines that lead to stories being read and shared online more often. A previous study analysed articles from the New York Times, and found that two factors lead to increased sharing: how positive an article was, and how emotionally arousing an article was. In a recent paper, Gwilym Lockwood investigated whether the same techniques worked for scientific articles as well. This can be measured by looking at the Altmetric Attention Score, which shows how much attention an article is getting online by tracking tweets, facebook posts, news article mentions, and so on. Over 2000 article titles published in a scientific journal called Frontiers in Psychology in 2013 and 2014 were coded for positive framing (e.g. using "smoking causes cancer", rather than "the link between smoking and cancer") and phrasing arousal (e.g. referring to "gambling" rather than "mathematical decision making"). It turned out that articles with positive framing and phrasing arousal in their titles received higher Altmetric scores, meaning that they were shared more widely online. In contrast, having wordplay in the titles actually lead to lower Altmetric Attention Scores, while having a question in the title made no difference. This is independent of the length of the title or how interesting the topic was. This shows that 'clickbait-y' techniques may just work for science too, and that scientists could use this to adjust their article titles to get their research shared more widely. Although, hopefully it will not lead to article titles like "38 Japanese ideophones that Dutch people went crazy over" or "What this researcher found out about human-avatar interactions will blow your mind".